Pattern condition: Uncut, factory folded and complete with instructions. The pattern is printed on bonded paper with colored cutting lines. Men’s and Ladies’ Late Georgian and Regency Greatcoat and Garrick, c. 1750- 1825. The pattern contains a Greatcoat which can be cut either single or double breasted and has the choice of a standing or a stand-and-fall collar. Any view, men’s or ladies, can have capes and the capes can be removeable. When paired with either the 3 layer cape or 4 layer cape option it is called a Carrick coat. The instructions include modern (theatrical) collar construction and period pad stitching. The coat body is the same for either the man’s or ladies’ version with only the sleeves being different. The front of the coat is plain. The back of the coat has pleats, a pocket flap, and pockets at the side backs, near the waist. The center back of the coat can be either finished with a pleat at center back waist and a back vent at the bottom, or finished so that the back is open all the way from the waist to the bottom. For ladies there is an optional belt included. The sleeves are full at the sleeve heads, cut two piece, with a fully functioning large cuff that folds up at the wrist. The sleeves are long, covering part of the hand as was fashionable in the period. 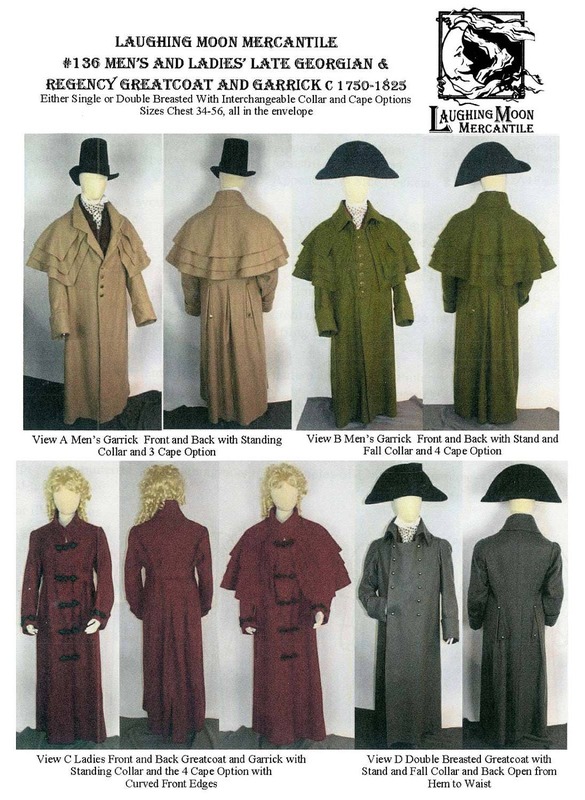 This overcoat is drafted to fit over the men’s garments of the period; shirt, vest, and tailcoat, so there is considerable ease drafted into the overcoat. There can be up to 10 inches of ease, depending on where you measure the body and the breadth of the coat. It is therefore recommended that a muslin be cut of the body of the coat and tried on over the garments intended to be worn under it before choosing a size and cutting your fashion cloth. 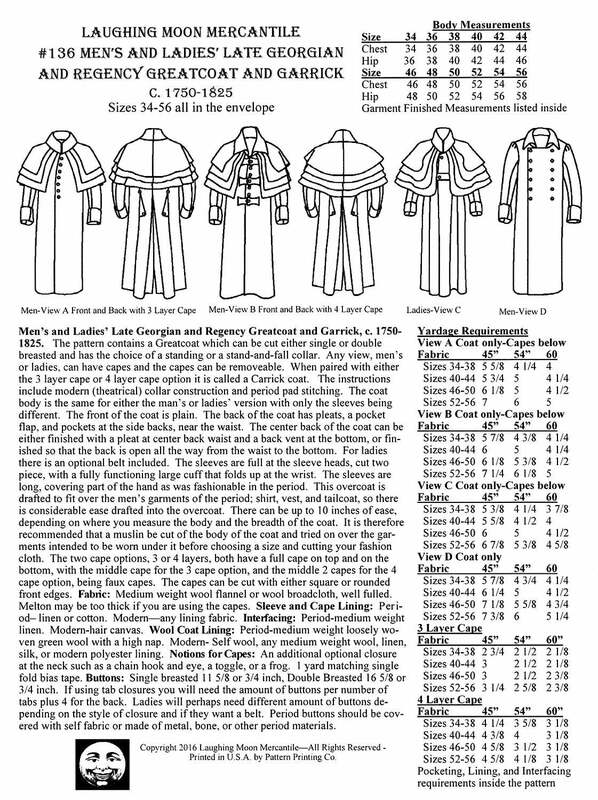 The two cape options, 3 or 4 layers, both have a full cape on top and on the bottom, with the middle cape for the 3 cape option, and the middle 2 capes for the 4 cape option, being faux capes. The capes can be cut with either square or rounded front edges.